It is a free standing rail with round uprights and round cross beams. 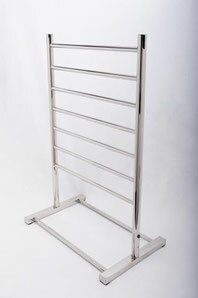 It is perfect if you need an additional towel rail or you simply don't have a heated towel rail and are not currently renovationg or building. You can even move it around to any room in the house! It is manufactured from 203 grade stainless steel and has a 2 year replacement warranty.